yesterday tardi, police owing to achieve informacion cu have one problem familiar in pampoenastraat at dakota. police at caminda, owing to enter informacion cu have one person injury, y cu one pick-up owing to happen on dje. but hour cu police owing to arrive, is as the colonia hatiano owing to leave y declara, cu not was one simplemente accidente, but cu pick-up intencionalmente owing to strike one compatriot of they y consecuentemente the chofer responsible owing to dicidi for happen cu the pick-up also on the person here. motibo cu the chofer owing to happen his pick-up on dje, is because one rato first the victima owing to strike one lady one fist. y pesey, the chofer here owing to happen his pick-up on dje, cu bad intencion. the paisanonan was reclama, cu neither cacho do not deal so. now, the chofer is deteni y encarcela, because past owing to intenta of kill of aggressor of one madam. ambulance owing to bay cu the victima more the madam victima of agresion. diahuebs nightfall owing to enter informacion of one action serious at subway at seaportmarket place. at arrival of the various patrol policial, they owing to constata cu had one action among one are of tourist venezolano y one another tourist mericano. the action owing to cuminsa hour cu the tourist mericano cu had much pura y wanted owing to happen fast of they everybody. the father not owing to permiti esey y at once the mericano owing to dal’e one wanta, the mother owing to fly mey-mey of they y also owing to achieve one wanta y so full the family owing to join y the action become one free for all, where till even one blackboard of propaganda owing to being break. police owing to take away they all at keep of police, where eynan they can owing to talk the asunto y not let one ugly view n’e shopping mall. diahuebs morning one patrol attentive, coriendo in jan flemming is descubri one child muher cu some day behind owing to huy again for of cas at north. at once the agentenan owing to become descend y talk cune y owing to bis’e p’e lever in car for compaña they for keep of police at north. eynan police will avisa the parents y after of talk severamente cu the child, that constantemente is huy of his parents. 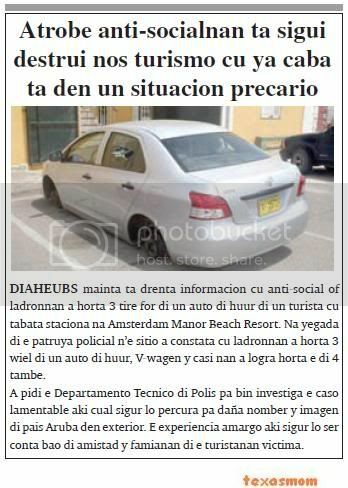 diaheubs morning is enter informacion cu anti-social or ladronnan owing to steal 3 tire for of one car of huur of one tourist cu was staciona at amsterdam manor beach resort. at arrival of the patrol policial n’e sitio owing to constata cu ladronnan owing to steal 3 wiel of one car of huur, v-wagen y casi they owing to succeed steal the of 4 also. owing to ask the departamento tecnico of police for come investiga the caso lamentable here cual assure will percura for spite name y imagen of country aruba in exterior. the experiencia amargo here assure will being count ; bao of amistad y famianan of the turistanan victima. police of santa cruz together cu ambulance owing to bay cu urgencia at one cas at papilon diahuebs nightfall, where have one man injury cu one chop enough big y deep on his eye. n’e sitio, police is come across h.kv. naci at the netherlands of 54 year, that was bleed profusamente for of one chop enough big on his eye left y was perdiendo conocemento. ambulance owing to transporte for poli for tratamento. the is tell police cu he c. de j. of 31 year owing to dal’e cu one iron of weight on his cabes. police owing to detene the sospechoso de j. for maltrato pisa cu arm y owing to hibe keep of santa cruz, where past owing to stay close.tur the maltrato here owing to start debi at internet. diahuebs night owing to enter informacion cu one car owing to strike one peaton at pavia. at arrival of the patrol policial n’e sitio, owing to constata cu one car owing to strike one person canando near of his bicycle bayendo east y one dado instant one car cu also was bayendo east owing to descend caminda y owing to dal’e y his bicycle mandanan high y after follow core. owing to ask presencia of ambulance cu urgencia. at arrival of the ambulance the paramediconan owing to atende the victima y owing to bay cune hospital cu the urgencia. yesterday morning the sospechoso rafael janga, owing to wordo condena at 12 month of jail for owing to menaza one cuidador of preso near of one bar in san nicolas. 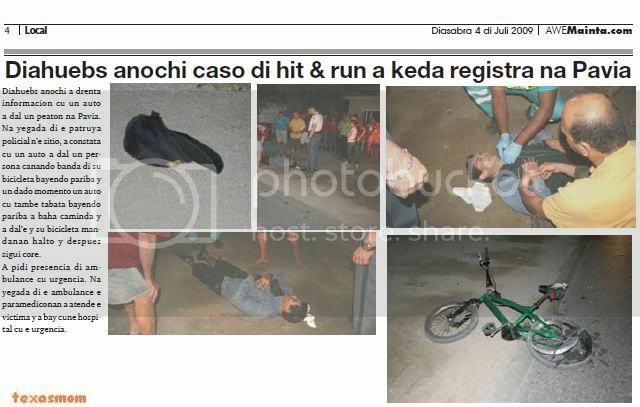 the incidente here owing to sosode day 13 of january 2009 in oranan of night. apart from the acusacion here, rafael janga is wordo sospecha of atraco cu violencia, posecion of ball cayente in cel y posecion of drugs. huez do not achieve legalmente prove the acusacion of atraco cu violencia of one cadena day 25 of december 2008. niether huez is achieve prove posecion of ball cayente in cel. past owing to tell cu rafael janga first cu past owing to wordo hinca in his cel at keep of police, owing to wordo listra. also past owing to show cu is janga self owing to entrega huez comisario one ball. niether huez is achieve prove posecion of drugs. huez owing to show cu rafael janga is talk of one thirst up, but huez is achieve cu this not owing to stay prove. past owing to tell cu have testigonan owing to declara of cu had one discusion. besides have police owing to see rafael janga march bay in direccion of car y bao of one car owing to come achieve the arm. yesterday morning huez owing to tell cu the is take rafael janga at bad for menaza one cuidador of preso of the form here. huez owing to tell cu is inaceptabel cu one employee of gobierno, in the caso here one cuidador of preso is wordo menaza for thing past owing to haci during oranan of trabao. huez owing to tell cu the is reduci the castigo of 18 month of jail exigi for fiscal by cu partinan of the acusacion owing to cay afo. past owing to condena rafael janga at 12 month of jail. ORANGE CITY - Rafael Janga was last week sentenced to 12 months unconditional imprisonment for threatening a jailer. This is six months less than the requirement of the Public Prosecutor (OM). The OM had demanded 18 months because of threats, armed robbery, possession of ammunition in the cell and drug possession. The Court considered only the allegation of threat proved. For the other offenses was insufficient evidence, said the judge. 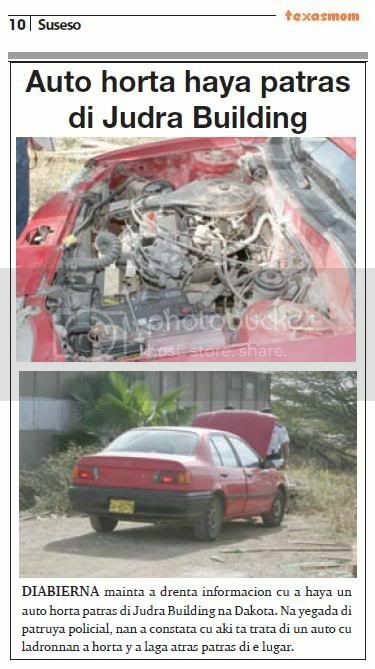 On January 13, 2009 Endangered Janga for a bar in San Nicolas prison guard KIA with a firearm. When the police caught him he tried his arms to come. He was on the ground and kicked it under a parked car. Witnesses saw it happen and agents assigned to the arms. Janga's claim that a group of employees of the KIA 'on him for "the court found no evidence. The court found the extra weight that Janga a government official has threatened. yesterday nightfall the tratamento of the caso penal contra eugene lampe did take lugar. fiscal owing to exigi life largo of jail for eugene lampe. fiscal is achieve eugene lampe culpable of premedita on day 4 of april 2008, in one form horososo owing to asesina his father in cura of cas y after owing to bay inside y owing to asesina his brother man, that was sleep on one sofa y finalmente owing to asesina his mother, that owing to arrive cas in oranan of nightfall. after of the asesinato cruel here, eugene lampe owing to bay at one store for cumpra thing the had have to for try sende the curpanan without life at candela. by of this owing to origina one candela n’e cas caminda bomberonan owing to come achieve the 3 curpanan without life in one cuarto in the cas. 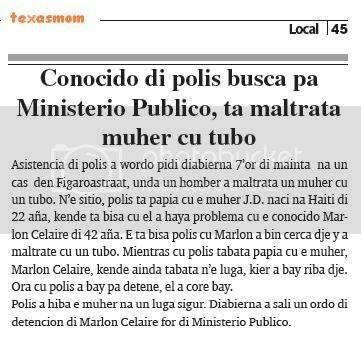 the caso here owing to last much for motibo cu ministerio publico owing to ask asistencia of expertonan of pieter baan centrum at the netherlands caminda the expertonan owing to conclui cu eugene lampe is one person extremely peligeroso by of the ailment mental cu the is abide of dje. owing to stay constata cu eugene lampe is sufiri of schizophrenia paranoid. yesterday tardi fiscal owing to present one rekisitorio extremely extenso caminda the is talk on the ailment of eugene lampe, but cu finalmente the is convenci, mirando the raport of pieter baan centrum, cu eugene lampe in cierto degree is responsible for his actonan. the is achieve cu the mature cu eugene lampe did take all time for owing to elimina his sernan keri, is show cu here is deal of one asesinato premedita. fiscal owing to exigi life largo in jail for eugene lampe. advocate mr. chris lejuez do not comparti the sharp of view of fiscal. the is achieve cu eugene lampe not can stop responsible for his actonan mirando the ailment cu the is abide of dje. the advocate also owing to show cu kia not t’e lugar adecuado for close eugene lampe, that have to of tratamento. past owing to show on one articulo of derechonan hulmano, caminda corte european owing to arrive of señala cu in one caso cu one person not can wordo interna at one lugar adecua, this is cay bao responsabilidad of kingdom dutch for percura cu the person here is achieve one lugar adecua. huez will bay evalua the caso here y will dicta sentencia dentro of some week. ORANGE CITY - Lifelong demanded the Public Prosecutor (OM) at the end of last week against the triple murder suspect Eugene Lampe (27). According to the prosecution psychiatrists have confirmed that Lampe in each case, "partly responsible" may be held for his actions. Moreover, as the officer, the chance that he will again commit such a crime. For the community to protect against this danger, for that would Lampe never released. 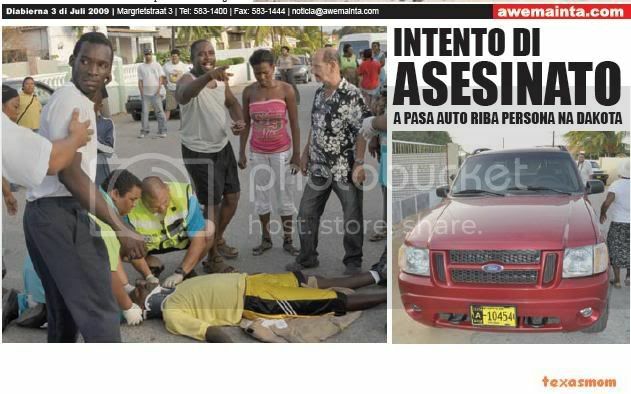 On Friday, April 4, 2008 were in their house in the neighborhood in Santa Cruz Macuarima three members of family killed Lampe: Father Juan (60), mother Aura (57) and son Edvard (30). The drug-addicted son Eugene was immediately arrested and later known in detail the murder of his family members. He would be a piece of wood his father, then his brother and finally his mother beaten until they no longer gave signs of life. Then he put their bodies on fire. He did so because his own father, mother and brother he wanted to destroy it under curatorship and the Dominican Republic would send to be homosexual. "The only guilty of what happened is my family," said Eugene a few months ago. Eugene Lampe was psychological evaluation to the Pieter Baan Centrum in the Netherlands, where he has research 'partly responsible' was held for the murders. He would not have bad influence of so-called command hallucinations. But would he be suffering from paranoid schizophrenia and dangerous to his environment. The court shall, within two weeks. 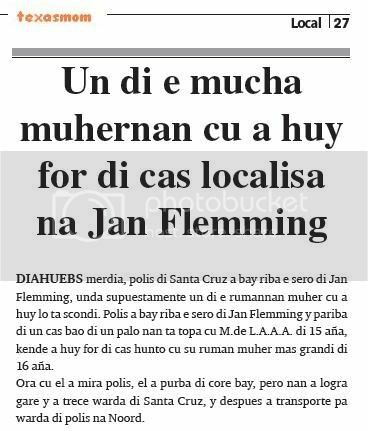 diahuebs afternoon, police of santa cruz owing to bay on the hill of jan flemming, where supuestamente one of the rumannan muher cu owing to huy will is scondi. police owing to bay on the hill of jan flemming y east of one cas bao of one tree they're come across cu m.de l.a.a.a. of 15 year, that owing to huy for of cas together cu his brother muher more big of 16 year. hour cu past owing to see police, past owing to try of core bay, but they owing to succeed gare y owing to trece keep of santa cruz, y after owing to transporte for keep of police at north. 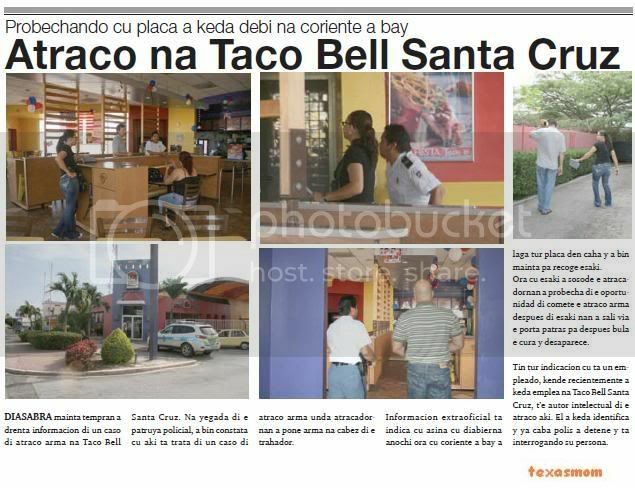 saturday morning early owing to enter informacion of one caso of atraco arm at taco bell santa cruz. at arrival of the patrol policial, owing to come constata cu here is deal of one caso of atraco arm where atracadornan owing to place arm at cabez of the trahador. informacion extraoficial is indica cu so cu diabierna night hour cu coriente owing to bay owing to let all coin in box y owing to come morning for recoge this. hour cu this owing to sosode the atracadornan owing to probecha of the oportunidad of comete the atraco arm after of this they owing to leave via the door behind for after fly the cura y desaparece. have all indicacion cu is one employee, that recientemente owing to stay emplea at taco bell santa cruz, t’e author intelectual of the atraco here. past owing to stay identifica y already end police owing to detene y is interrogando his person. ORANGE CITY - The Taco Bell in Santa Cruz is Saturday morning by a man armed robberies. After employees of the fast food restaurant by the power outage last Friday had gone home early, they were Saturday morning the cash to closing. When an armed man walked inside the case, for a short time later with a booty of between 3000 and 4000 florin to leave. Some workers recognized the man as a colleague and gave him to the police. The robbery team arrested the man later in the Middenweg to Orange City. It was also made a raid in a house at the Sibelius Street. The investigation in this case is still ongoing, since the loot made money is not found and the police involvement of several persons in this armed robbery can not exclude. diabierna morning police is informacion cu ladronnan owing to break enter steal one radio cd for of one car at one compleho of apartment at paradera. hour cu patrol policial owing to arrive, they owing to constata cu here is deal of one v-wagen cu one tourist mericano owing to huur. 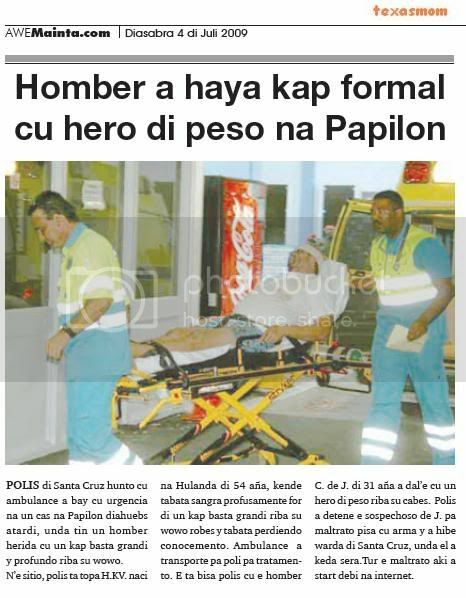 the lady cu owing to become victima of ladronicia owing to count ; we cu this is one bad experiencia pe y cu this is bad propaganda for aruba in exterior. diabierna morning owing to enter informacion cu owing to achieve one car steal behind judra building at dakota. at arrival of patrol policial, they owing to constata cu here is deal of one car cu ladronnan owing to steal y owing to let behind behind the lugar. 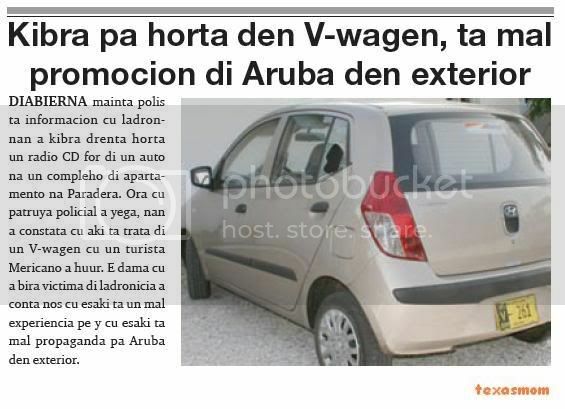 diabierna morning owing to enter informacion cu ladronnan owing to break one car at one compleho of apartment at bubali. hour cu police owing to arrive, owing to constata cu here is deal of one v-wagen cu one pareha tourist dutch owing to huur. the pareha cu owing to become victima of destruccion owing to count ; we cu this is one bad experiencia for they y cu this is spite the imagen of aruba in exterior. 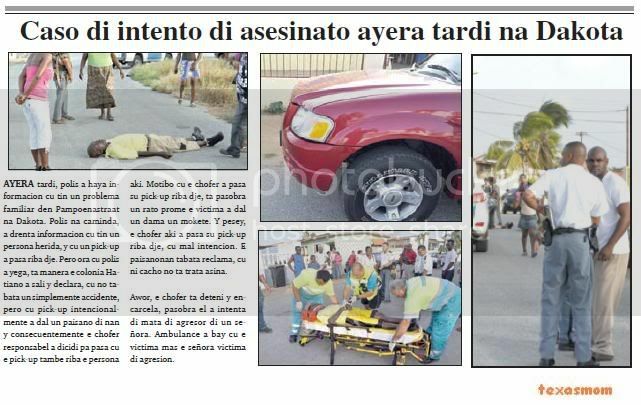 police of oranjestad, saturday 3.30 of nightfall, is see the conocido of police y of husticia marlon celaire is core on one bromer blanco bayendo direccion beach. hour cu police owing to dune one sign p’e stop, past owing to press gasoline y follow core. at rotondo of tanki flip, past owing to become direccion sasaki, y near of rotonde, past owing to stop. at once police owing to detene y owing to hibe keep y entregue at recherche, cu was busk’e for several delito cometi. asistencia of police owing to wordo ask diabierna 7’or of morning at one cas in figaroastraat, where one man owing to maltrata one muher cu one tubo. n’e sitio, police is talk cu the muher j.d. 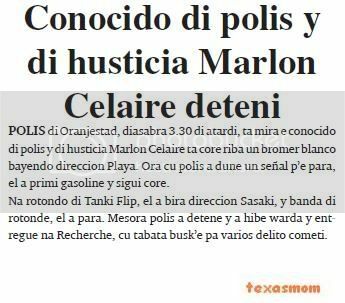 naci at haiti of 22 year, that is tell cu past owing to achieve problem cu the conocido marlon celaire of 42 year. the is tell police cu marlon owing to come close dje y owing to maltrate cu one tubo. while cu police was talk cu the muher, marlon celaire, that still was n’e luga, wanted owing to bay on dje. hour cu police owing to bay for detene, past owing to core bay. police owing to take away the muher at one luga assure. diabierna owing to leave one ordo of detencion of marlon celaire for of ministerio publico. diabierna corte in first instancia owing to deal the caso of extorsion much comenta in comunidad. is deal here of the sospechosonan. denis oduber y thomas calderon is wordo acusa cu among 27 of feburary 2009 till cu 14 of march 2009 owing to menaza y using violencia for obliga family of fayecido advocate mr. john van der kuyp for pay 250 thousand dollar. owing to calling via telephone y exigi for pay 250 thousand dollar or but blood will derama. via apparatus of message again menaza cu will happen algo cu family y cu will bay come person of exterior. also owing to send one carta for one acolyte of family cu is tell cu they owing to come for cobra 250 thousand dollar y cu if not pay, algo will bay happen. fiscal is achieve cu the pair here owing to using 4 form of presiona the family. huez owing to show cu denis oduber owing to tell cu the not have nothing of haci cu the extorsion, while cu calderon thomas owing to tell cu past owing to follow orden of oduber. huez owing to tell cu in the caso here will have to saca afo, that is talk the berdad. police owing to graba one cantidad of call..
according calderon the was calling the madam of difunto van der kuyp on instruccion of oduber p’asina spant’e. oduber is stop on cu the not owing to give informacion at calderon p’e calling. oduber owing to splica cu the is much good amigo of difunto van der kuyp y they was socio in some business y cu van der kuyp owing to dun’e cara abao y cu now have person is busk’e for achieve coin. according oduber, van der kuyp owe because; 60 miyon guilder. huez is achieve cu oduber have motibo for is much angry for achieve the cantidad of coin cu van der kuyp owe. huez is achieve cu this is sufficient motibo for oduber is presiona for achieve his coin bek. according oduber, the person gilberto polanco owing to talk cu john van der kuyp on 8 miyon dollar y after past owing to calling denis oduber y is exigi oduber for pay hour past owing to achieve know cu van der kuyp owing to fayece. is deal one cuestion of transferencia of coin via canalnan diplomatico. oduber owing to tell huez cu polanco y van der kuyp owing to talk cu another y the not know of nothing. according calderon, pablo owing to yam’e at sand domingo y menaze cu will have to pay 10 thousand dollar of coin cu past owing to lend. according calderon, pablo owing to bis’e for bay serca oduber. 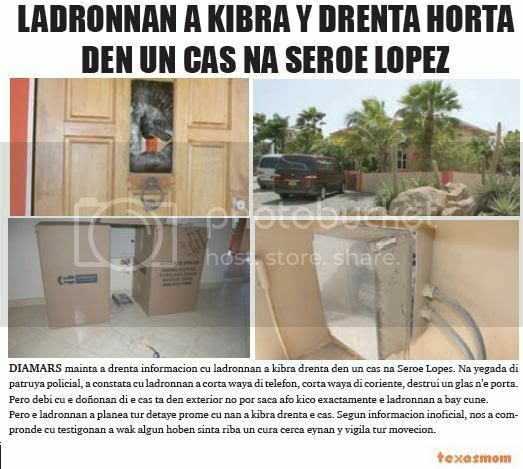 according calderon, is oduber owing to dune number of telephone of the madam viuda. huez owing to remarca cu the menazanan was much fastioso y was hinca the family in much angustia. past owing to follow tell cu the is constata cu the declaracion of calderon y oduber is much various. during tratamento of the caso hour cu huez y fiscal was haci questions y cu was achieve declaracion of the two sospechosonan, is seems as one pelicula was take lugar. the yiunan of difunto y sra. vda. was present y they owing to demanda they estadia in one hotel recomenda for police cu is being calcula more of 3 thousand guilder. the family owing to tell cu they not have sosiego more. the such pablo cu is at sand domingo now will can send cualkier type person on they. this is one angustia much earnest for family. they're teme for they yiunan. they owing to remarca, what garantia have cu this will not go back ripiti. this do not first trip y the trankilidad in family not tey more. according the family, oduber is lie y cu oduber know very good kico is kico. fiscal owing to show cu day 27 of feburary 2009 owing to cuminsa cu call of menaza y day 28 of feburary owing to calling various trip y cu they know where the family live y cu will bay cause damage n’e autonan staciona fast the cas. also menaza cu will derama blood if not pay. achieve cu they had plan dirigi on extorsion. can conclui this for of the cantidad of yamadanan cu police owing to graba of yamadanan among oduber y calderon. the mature cu do you not can stay live more in do you own cas, because have temor of wordo kill, is much earnest caminda the family for añas will can stay in trauma. fiscal owing to notice cu the family not owing to demanda damage inmaterial. past owing to aproba the demanda of the family for cubri they estadia. past owing to tell cu the will not bay haci distincion in funcion among the two sospechosonan. past owing to exigi 3 year of jail for cada one. huez owing to close tratamento of the caso y owing to tell cu day 9 july for 8.30 of morning the will dicta sentencia. ORANGE CITY - The Public Prosecutor (OM) demanded last Friday, three-year unconditional imprisonment of the suspects Oduber and Calderon. The pair is suspected of extortion of the family Van der Kuyps. The duo tried the family by means of threat, intimidation and violence to 250,000 florin cheated. The two, according to Justice in the period from 27 February 2009 to 14 March 2009 relatives of the deceased lawyer Van der Kuyps threatened. Also they have used violence in order to obtain 2.5 tonnes. During a phone call would have demanded money and threatened: "If not, then there blood flows." Evidence of the threat was delivered by a more recording on the answering machine of the family. Here was a threat to voice the family would be slightly affected if they do not pay. " Writing was squeezed off the family to pay 250,000 florin. Finally, the police appeared to have made recordings of telephone threats. Both suspects tried to blame each other in the shoes and refused to move the other as' mastermind '. It is now up to the court to determine the truth. According to Calderon, he called on the widow of instruction Oduber. It's to scare. Oduber Calderon maintains that he had ordered so no. He stated that he was good friends with the deceased Van der Kuyps and that they were business partners. Van der Kuyps has him 'to choke' and now there are creditors looking for him. According to Van der Oduber Kuyps 60,000 florin him guilty. In addition, creditors of Van der Kuyps now Oduber knock. "While I know nothing." 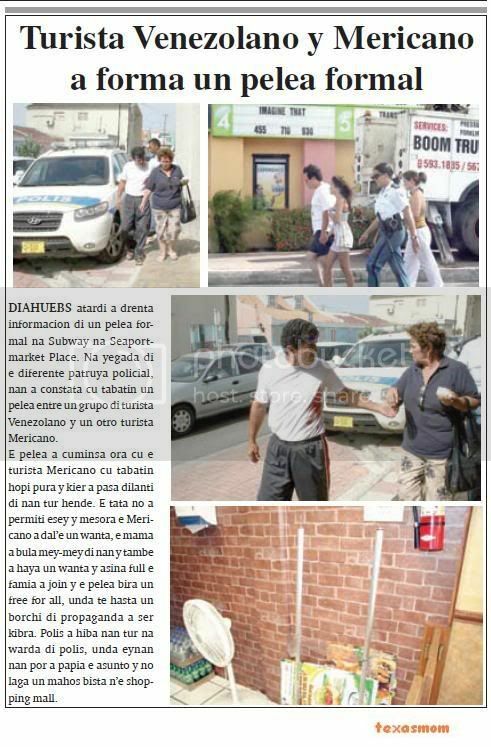 According to the family Oduber lying and he knows very well what is going on. " The Court saw in the statement of the suspect enough reason to be very angry, and want the money back. The threat of the family is unacceptable according to the court and provides a lot of fear and unrest. Thus we find the family on the advice of the police for some time hiding in a hotel. They also require reimbursement of hotel costs of the two. This represents more than 3,000 florin. "We have no more peace", so let the family Van der Kuyps know. The judge is ruling on July 9.
huez owing to reduci the exigencia of fiscal of 7 for 5 year of jail for eric de cuba, that is wordo achieve culpable of attempt of asesinato. diabierne huez owing to tell cu the is achieve eric de cuba culpable of attempt asesinato. the is achieve cu owing to stay prove cu day 23 of december 2008 morning early de cuba owing to hinca the victima dubero cu sker at throat. t’asina cu eric de cuba was stop on cu the not owing to agredi dubero. huez owing to show cu dna at the netherlands on piece sker achieve in car of dubero owing to show cu is de cuba had the sker here in his power. huez owing to remarca cu first de cuba owing to desmenti of owing to ataca, but hour owing to confronte cu the result of dna past owing to tell cu by of consumo of drugs y alcohol do not corda nothing more. 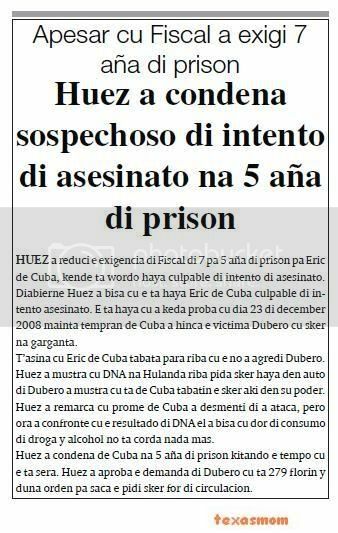 huez owing to condena de cuba at 5 year of jail kitando the time cu the is close. huez owing to aproba the demanda of dubero cu is 279 guilder y give orden for saca the ask sker for of circulacion. SAN NICOLAS - In one of the apartments of the Jaracomplex in Savaneta last Friday was a cross party place. Agents found the 43-year-old A. C. with injuries to his chest. He had two sons of his neighbors had fought with him. C. refused to have anything to say. The agents then went to talk with buurjongens J. D. (21) and J. D. (20). This indicated that C. drunk and under the influence of drugs with a knife and walked out was that it sticker he had been arrested. Another witness knew their story to confirm. The ambulance was called and C. was taken to the medical center in San Nicolas for his wounds to treat. Of the agents gave him the advice to contact the police, should he wish to return. ORANGE CITY - Friday police were out to Piedra Plat, where a man his sister was threatened with a knife. M.L. (41) expressed its deep concern to the agents who had been severely depressed because her brother RL (31) with a knife started to swing. The day before he would have tried to commit suicide. The agents tried to talk to the man, but just wanted them to say that he has no problems with the police. Then he is in his room. The agents were no different than the family members to advise professional help. tuesday morning owing to enter informacion cu ladronnan owing to break enter in one cas at seroe lopes. at arrival of patrol policial, owing to constata cu ladronnan owing to clip wire of telephone, clip wire of coriente, destrui one glass n’e door. but debi cu the doñonan of the cas is in exterior not can saca afo kico exactly the ladronnan owing to bay cune. but the ladronnan owing to planea all detaye first cu they owing to break enter the cas. according informacion inoficial, we owing to compronde cu testigonan owing to look at some young sit on one cura close eynan y vigila all movecion. tuesday morning owing to enter informacion cu at ponton owing to succeed captura a cu owing to destrui one window for enter steal. at once owing to dirigi police n’e sitio. at arrival of the patrol not owing to succeed achieve the person indica, but if owing to succeed arrive n’e adres, where the destruccion did take lugar. eynan police owing to compronde cu the sospechoso owing to succeed libera y huy. one witness, cu owing to arm his self cu machete owing to core behind the thief here, but the thief was more liher cune. after police owing to rondia in the becindario, but without result. Page created in 2.413 seconds with 19 queries.